(Newser) – Ghostwriters funded by a drug firm were deeply involved in writing papers supporting therapies that helped the firm’s sales boom, court papers show. The 26 scientific papers, published in medical journals from 1998 to 2005, highlighted the benefits of hormone replacement therapy over the risks, a boon to Wyeth, which paid the writers. The news hints at the extent to which drug firms may pull strings in medical literature, the New York Times reports. Researchers later found that HRT may increase the risk of cancer, heart disease, stroke, and dementia in some patients. The court papers show Wyeth paying a medical writing firm to develop articles and get doctors to sign off as authors despite minimal roles in the pieces. 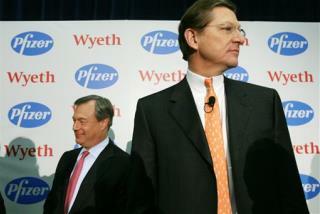 A Wyeth rep said drug firms often use such firms to help authors; the material, he said, was valid. And you have hit the nail on the head. Let's not pay attention to the greed and corruption that has permeated seemingly ALL sectors of commerce. ALL industries -financial, health, military, auto- are looking to maximize greed. The problem is when deception becomes life-threatening, medically or financially. Don't sell me rat poison and tell me it's aspirin. While everyone's over on the political threads, flaming and name-calling, they're ignoring news of a truly evil and insidious threat in their country. What a shame. The medical drug-cartel will say and do anything to protect its monopolistic dynasty, morality issues and the patient's welfare be damned.